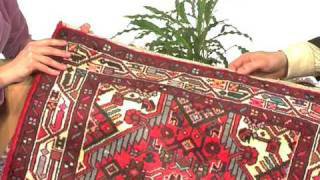 Information about Hosseinabad carpet from Persia / Iran. This carpets is knotted in the village of Hosseinabad and its surroundings in north-western Persia. The patterns on the carpet is often from the so called Herati-type, inspired by older Farahan carpets. The carpet is thick and rough, and are all part of the group of Hamadan carpets.